There are mangoes everywhere so why not use in Mitahi and enjoy. Traditional Kalakand mithai with a twist. 3 cups of fresh mango pulp or if it is not available use canned or frozen. I used fresh as it si mango season right now. 1 silver varq for garnishing. In a non stick pan add paneer and condensed milk. Stir continuously and keep it is low heat. When the mixture turns thick add mango pulp. Stir in so that it is mixed well. If the mixture is tough to stir add on the milk now. Cover the lid and let it simmer till it turns real thick mixture. Pour the mixture in deep pan or 2 inch tray. Garnish with chopped pistachios and let it cool down. Now cover the silver varq carefully on whole mithai. Cut in bite size pieces and enjoy. 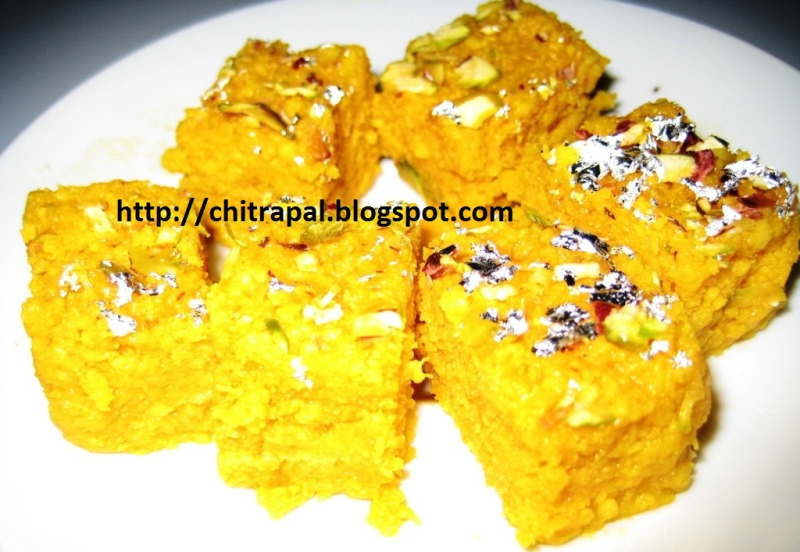 Share homemade mithai with your neighbors and family members. Is this where you got this recipe from dear Chitra http://www.youtube.com/watch?v=PdVSFkQUHL8??? wow!mango kalakand..I'm sure gona try this.thnx 4 sharing. No problem Khuserv, I know you will love it and who does not like mangoes. These look so yummy but I will try them out and then vote if you do not mind Chitra. Your other recipes turned out quite well with me.Thank you. Thanks Rabz..Btw where do you work in UAE? Nice experiment I am sure they will taste nice I am deff going to try these out. Thanks 4 posting.